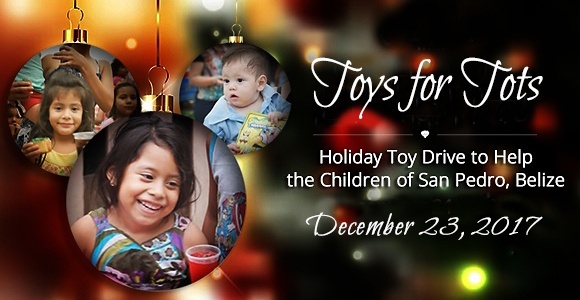 Grand Baymen teamed up with local organizations to participate in a massive Toy Drive in San Pedro. Over 1000 toys were given away, and over $4500 was donated. Grand Baymen and is certainly getting into the Christmas season! Santa visited San Pedro early this year! The annual Toy Drive hosted by Living Word Church gave over an astounding 1000 toys to children in the community. The giveaway was a major event, taking place in the Saca Chispas Football Field in downtown San Pedro. The park was filled with parents and kids, over 1000 attendees in total, with children enjoying their new toys amongst other festivities. It is so important to the goals of Corporate Social Responsibility that Grand Baymen upholds to be involved in projects such as this one. Every month, Grand Baymen chooses and works with a local charity that is committed to improving the community. In August, for instance, Grand Baymen worked with the Holy Cross Anglican School to provide students with a quality-learning environment. The Anglican School prepares students for working in a 21st Century environment, as well as providing for the health of the children in the form of nutritious lunches, dental care and volunteer doctors. The continuing organization that Grand Baymen chose to work with is Living Word, a wonderful pillar of the community. In total, over USD $3,900 was donated by the Grand Baymen community, including property owners, shareholders in the parent company, and vacationers who fell in love with the island. An additional USD $1,000 was donated from Grand Baymen. Pastor Ian’s enthusiasm surely shows. He is a man who cares deeply about his community. That is why he was so pleased to work in partnership with Grand Baymen, for both organizations to come together and help the community members of San Pedro. If you would like to be involved in one of Grand Baymen’s many upcoming charity events, such as the toy drive, you can do so by contacting us here. And while you’re down here, enjoy some of the amazing weather, world-class snorkeling, and slow-paced, ever-relaxing island life. And the good news is that it’s easier than ever to get to Ambergris Caye! New flights to Belize are being set up all the time, such as the latest flight expansion to Belize, a twice weekly flight between Toronto and Belize City which began running in early November. Now it’s even easier for our Canadian friends to come down to escape the winter blues on the island. If you’re thinking of where to go and what to do on your next vacation, staying at Grand Baymen on Ambergris Caye may be just the getaway. Enjoy wonderful tropical weather, North-American standard amenities, and you can even participate in one of our many Corporate Social Responsibility events. A luxury vacation in the Caribbean as well as making a positive impact on the local Ambergris Caye community? Sounds like a win-win vacation idea.